The old adage of 'If it ain't broke, don't fix it' has no place in today's digital marketing landscape. Quite simply, for any organisation to establish, maintain and grow its profile and market share, all promotional activities must stay abreast of today’s rapid and continuous technological developments. ““stannahlifts.co.uk is a large and complex site which needs to address different areas of the business and audiences, with the ultimate visitor goal varied based upon these two factors. bandv has a strong understanding of the business and was successfully able to address all our requirements with the new site, even when we added a few more at the last minute! “As an additional challenge we made the decision to introduce a marketing automation system halfway through the process. This was all taken in their stride, with the digital and design team working hand in hand with us, ensuring every comment and amendment was worked through. The bulk of the job landed firmly in the expert hands of our Senior Web Developer, David Essery, Junior Digital Developer, Jamie Rose, Senior Designer, Diarmid Langley, and SEO & PPC Specialist, Shawn Harding. Between them they evaluated the requirement and devised, orchestrated and monitored its transition. At our prompting, Stannah was considering incorporating the HubSpot marketing automation system, an inbound marketing and sales platform that helps companies attract visitors, convert leads, and close customers – a must for today’s businesses. As the project was well underway when the decision to use HubSpot was made, this dramatically increased the scope of work but, as we use HubSpot ourselves, we were able to accommodate the integration with agility. “The scope of work was considerable and had to allow for last minute changes, not to mention the big decision to integrate HubSpot. Considerable strategy planning and research established the scope of work – an essential process that created a firm base from which to proceed to site structure development, concept and design work, from initial ideas to all page types. "The integration of HubSpot generated extra work such as initial collateral, a blog, landing pages and CTAs. I also had to liaise with clients at every stage, and work closely with David and Jamie to ensure that every aspect was technically sound and delivered on time. Every section – and they are legion – had to be written from scratch. Fortunately, our 38-year heritage as Stannah's marketing agency softened the sting; they are in our blood – fact! Input came from all our copywriters and key Stannah personnel. “As far as the copywriting was concerned, it had to reflect the tone of the new website and this had to be sustained over many pages. Images are a vital part of content and, thanks to our UK-wide raft of freelance professional photographers, the new website gets the quality images it deserves. These photographers are the unsung heroes behind Stannah’s marketing presence, and warrant a blog of their own, which, strangely enough, we have covered: Photographers: a shout-out for unsung shutterbugs. 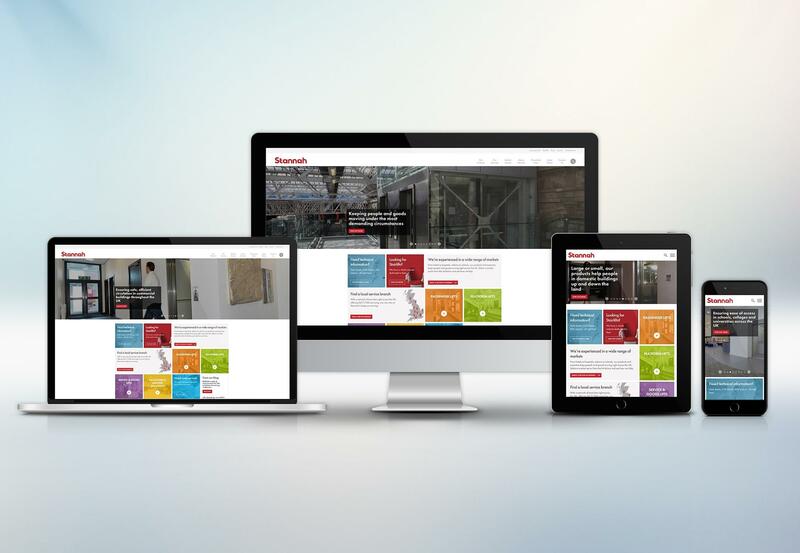 Despite its relative infancy, the new website has been well received by all divisions of Stannah – Lifts Limited, Lift Services and Stairlifts.